GaryMoller.com - Health, Fitness - Naturally! : How close to going for a run can I drink a Super Smoothie? How close to going for a run can I drink a Super Smoothie? I am trying some of Gary's "Super yuk Smoothie" and would like to know how close before going out for a run could I consume it? And is it ok to mix with egg and fruit before a run and leave it in the fridge for after the run? How much powder and liquid would I use and can you mix it with milk rather than water? Pauline, I quite like the new name. Can I use it? Seriously: Taste is very much an individual matter and we can't please everyone. The other point about taste is things that are very good for you do not always have to taste great. Think of the cod liver oil Grandma used to dish out during Winter visits! If the run is anything more than a leisurely trot, it is best not to have anything, other than water, within the hour of commencing the run. Any closer and your risk suffering a tummy upset. It is fine to have egg, fruit and just about anything else you like in your pre-run smoothie - SO LONG as you have it far enough out to be sure that the Smoothie has been thoroughly digested by the time you begin running. We all digest at differing rates, so the best advice is to experiment with ingredients and timing. The Smoothie can be left in the fridge for several hours, but not if you add ingredients like fruit which will go brown and gluggy. Now that is "yuk!". It is fine to use milk but give preference to a mix of coconut cream/milk and water. 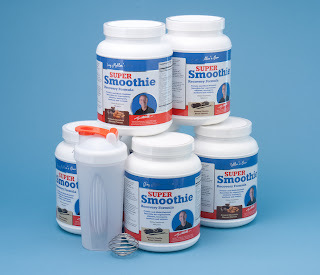 Have half a scoop of Super Smoothie mix for your breakfast Smoothie which you can add all kinds of goodies such as raw egg, flax oil, fruit, coconut cream/milk and even a weetbix! Then, for over the day, make up 700ml with one full Super Smoothie scoop, with a mix of water and coconut cream/milk. Shake well and have one glass at 10am, another at noon, another at 3pm and the rest, if there's any, before dinner. Keep it in the fridge between feeds. This regime will ensure a steady dribble of high quality nutrients into your body as opposed to a single daily deluge which is usually the case. You will find that any excess fat (if you have any) will drop off while preserving strength and energy. Here are the product pages for the Super Smoothie. Here is the blog page for the Super Smoothie.